The University of Oregon’s football team had one of its most successful seasons in history, such has not been the case for the basketball team. Bankrolled by Nike founder Phil Knight, the school built a new basketball arena to help firmly entrench Oregon as a basketball power. After firing longtime coach Ernie Kent, the University’s financiers went on a search to find the right man to lead the program. After being rejected by Tom Izzo and several other high profile coaches Oregon signed Creighton head man Dana Altman. Altman had much success with the Blue Jays turning the program from an also ran to a perennial power in the Missouri Valley. His tenure in Omaha boasted 11 consecutive 20 win seasons and seven NCAA Tournament appearances. This sustained success is what caused Oregon booster Pat Kilkenny end his search with Altman. Altman has since learned that simply showing up on campus in the bright lights of a major conference program with a fancy new gym is not necessarily a cake walk. The Oregon program has seen many defections leaving the program without much of a direction. After four players transferred and one went to play professionally overseas, Altman had to try to pick up the pieces. What he thought was going to be an big team turned out to be one he is more accustomed to. 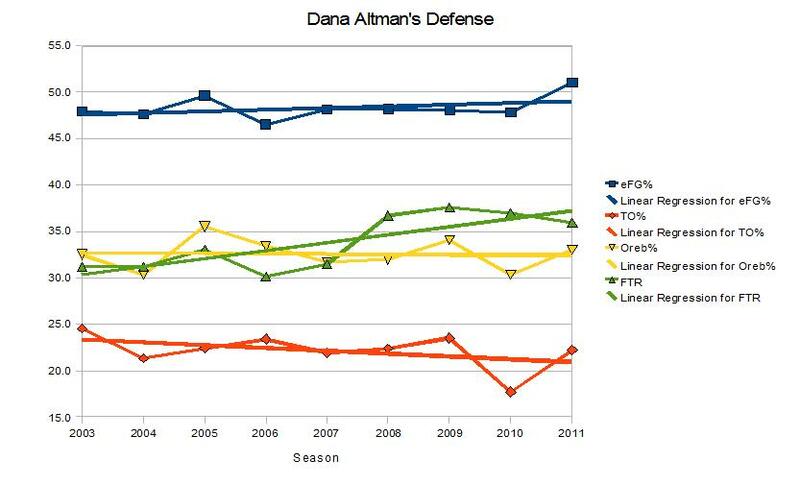 Altman is known for having undersized teams dependent on shooting at the expense of rebounding. His 2-1-2 high post offense has been crafted to fit such personnel. The prototypical example of Altman’s preferred brand of basketball is his only All-American Kyle Korver. Korver was a tall swing forward with a silky smooth shooting stroke whom the Blue Jays ran their offense through. That season he took nearly 20 percent of the teams shots and 39 percent of Creighton’s three point attempts. Altman’s offense will likely feature one player, typically a small/power forward. This season that role has been filled by 6’6” senior Joevan Catron, who is the 67th most used player in the nation. Catron does not fill the Korver prototype because he is not a proficient long distance shooter. He is more in that position because of his status as a senior leader rather than his skill set. A more natural fit is found in Sophomore swing man E.J. Singler. Singler, the less homely little brother of Duke’s Kyle, is a 39 percent shooter from behind the arc and a 51 percent marksman from inside. Further he has a good handle for someone his size and is a decent passer and defender. Next year’s offense will likely feature the Beaver state native perhaps allowing him to recreate some of the younger sibling magic put forth by Notre Dame’s Ben Hansbrough this season. Collectively Oregon will run Altman’s high post offense, which is similar to the scheme that Marquette employed to manhandle Xavier. Oregon is not as big as Marquette however so the offense will be run farther from the basket at the expense of rebounding. Unfortunately, for the Ducks there are not many shooters on the team which hinders Altman’s schemes to work properly. On the other hand, this Oregon team has met the high standards Altman sets for his ball handlers doing a good job of taking care of the ball. 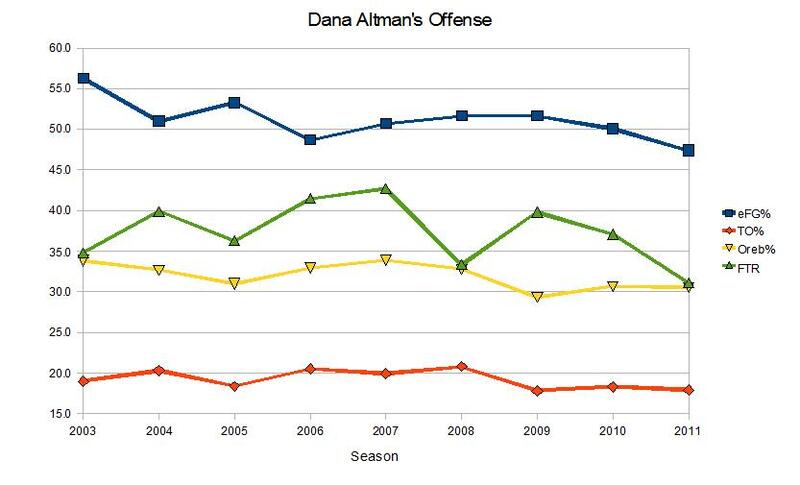 On defense there has been a trend over Altman’s recent seasons of decline. The year’s Oregon club is no different. Particularly of note is the increased proficiency with which opponents are getting to the free throw line. Obviously this is not of benefit to a poor free throw shooting team like Duquesne. What is of benefit is the poor field goal defense. Oregon ranks 260th in effective field goal percentage which bodes well for the Dukes as I have explained before. Duquesne is the superior team in this matchup, however Oregon has the superior coach. That could be the difference. A good game plan could end Duquesne’s season but if talent alone should decide this game the Dukes will likely prevail. Coach Ron Everhart would be wise to deploy the platoon strategy which was so effective in the Montana game. Keeping players fresh will allow the Dukes superior athleticism to shine through as well as allowing the offense to function properly with movement. Do not be fooled, just because Oregon is a BCS school does not make Duquesne an underdog. The Ducks are the inferior team and this game is one Duquesne should win, but playing on the road and a long lay off allowing Altman to devise a game plan could quite well tip this game in Oregon’s favor.